Central Coast Art! The Central Coast of California offers a diverse collection of original art. If you are planning a visit to the Central Coast you must take a little time and explore the rich creations and designs by some of the greatest artist in the world. Unique, fresh and inspiring galleries of all mediums abound throughout this beautiful region of the Central Coast of California and we are going to help you find those galleries and artist. We live in Cambria, California which is a hot bed for artist and has been for years. It is no secret that William Randolph Hearst loved fine art. Anyone who has visited the Hearst Castle realizes the importance Mr. Hearst put on art. Many artist migrated to the central coast as a direct result Hearst promotion of fine art. Art is still a primary focus and attraction on the Central Coast of California. You can find Central Coast Art in every form and fashion in every town on the coast. Whatever your fancy might be you can find it on the coast. We want to help you on your search for Central Coast Art by directing you towards various galleries as well as introduce you to a few local artist on the coast. Even if we wanted to we could never find all the artist on the Central Coast. However, we happen to know a few and we want their work to be noticed. The Central Coast of California offers a diverse collection of original art. Click on the picture and it will take you to information on Central Coast Art in that town. Cambria's Allied Art Association is the perfect place to explore when looking for art in the Cambria area. However, Cambria is home to many artist of whom you would never find. We are going to feature several local artist so stay in touch for more information. San Luis Obispo Museum of Art is the place to look for what is happening concerning Central Coast Art in San Luis Obispo. The Museum of Natural History in Morro Bay is the only natural history museum in the state park system. It can give you directions on the history of art in the area. 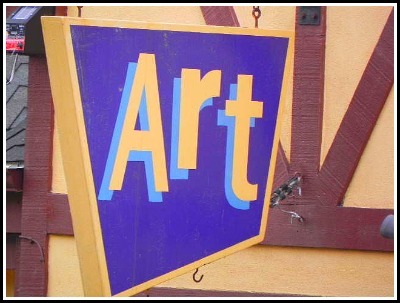 Discover art in Paso Robles. The purpose of the Paso Robles Art Association is to provide North San Luis Obispo County with quality art. Click on the image to find a complete list of art galleries in the Pismo Beach area. The Clark Center in Arroyo Grande is dedicated to the performing arts. For information on events at the center click on the picture. This is only the beginning of our coverage of art on the Central Coast of California. We plan on feature local artist on a regular basis. Please stay in touch by monitoring our blog.